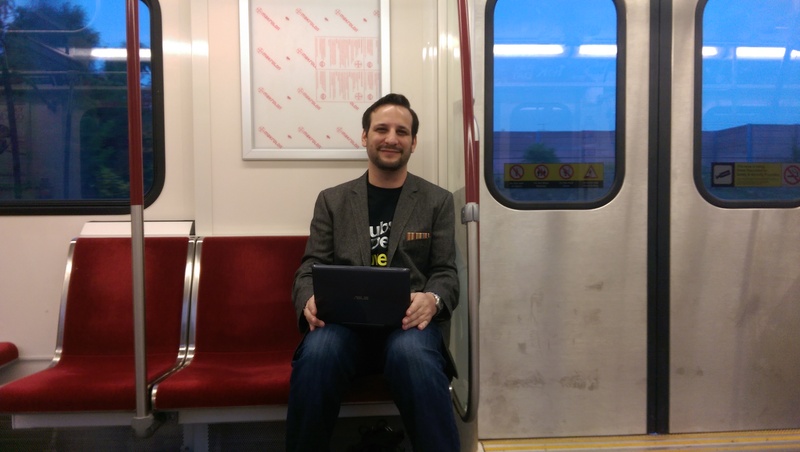 Using the Intel Asus tablet on the TTC Subway train writing this post. 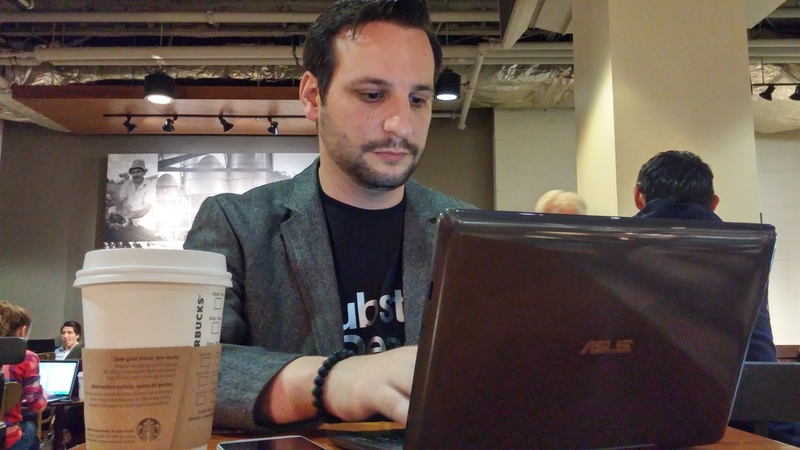 As a guy who is constantly on the go in the city of Toronto and beyond I have to say having the Asus Transformer 10.1 Tablet powered by Intel is an absolute dream. It is lightweight, takes up very little room in my bag, has a QWERTY keyboard with a mouse touchpad, and comes complete with a fully functional version of Windows 8.1 and Microsoft Office. 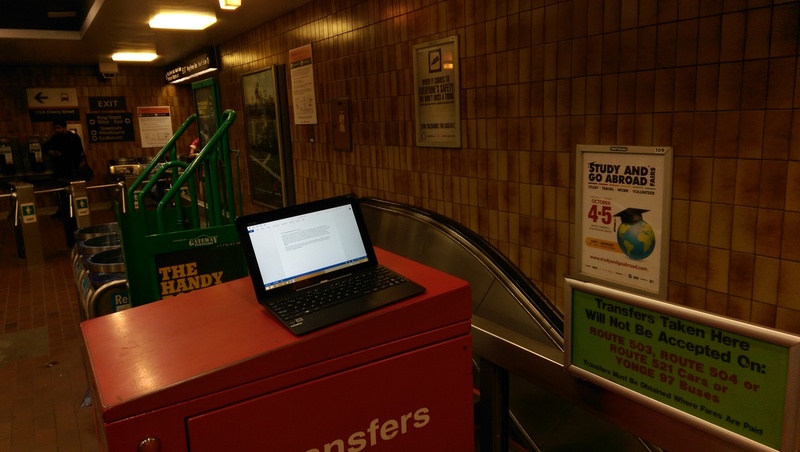 The detachable nature of the keyboard and full touchscreen capability of the device mean I can use it for reading ebooks or pre-loaded web articles even in the depths of the subway with no signal (which would come from my cellular device being used as a Wi-Fi hotspot). The tiny footprint of the device also means that I’m ready to get things done pretty much anywhere. Case in point, this sentence was actually typed as the device sat on top of the transfer machine in Toronto’s TTC King Subway Station! Although the new version of Windows – Windows 8 – takes some getting used to this is something that is a Windows thing and not a comment on the quality of this device. Wherever I need it to do some work be it on the subway, in a Starbucks, lying on a couch, or on my desk, the Asus Intel is great for getting the job done! Of course, I should mention that this device was kindly supplied to me by the folks over at Intel Canada as part of the #IntelCanada Intel Insiders program. But being a guy who usually goes for a 15.4 inch screen laptop with tons of power the portability aspect of this device is just so amazing I can honestly say I should have got one or one like it on my own dime years ago. I'm required to disclose a relationship between our site and Intel Canada.